Ayelet and I met in Ann Arbor, where we were both candidates in the MFA program at the University of Michigan. I think she can bring down people's blood pressure with her comforting voice alone (though unlike Ayelet, I don't have a nursing degree and so my theories are not necessarily medically sound). Definitely don't miss her essay, "Igloo." Ever since my first job, I’ve always smelled like work. Summers working as an art camp counselor I came home smelling of paint, of clay, of the darkroom with its liquid trays of metallic scent: developer, stop bath, fixer, fixer remover. After every 8-hour shift at the university library, my hands would smell of ink and binding paste. In nursing school, I would drive home after a shift at the hospital, strip as soon as I walked in the door, and beeline for the shower to scrub the scent of the med-surg or pedi floor off of my skin. It didn’t matter how many times I’d changed my gloves during the shift, or how many power washes I gave my scrubs. The scent of sweat in the sheets, of plastic tubing freshly opened, of urine, of feet, of sadness, of televisions with the sound off, of blood, of macaroni, of open sores, of fluorescent light—these followed me home. Now I am a psychiatric nurse practitioner and what I smell like seems more complicated. Whenever a patient comes into my room I smell them, and their smell becomes a part of our interaction. Sometimes the way that happens is obvious—if the smell is alcohol, or cigarette smoke, or unwashedness. But usually the smell is something quieter, like an emotion, but more characteristic of the person in that it doesn’t seem to change from session to session. Honey. Black lab. Marijuana. Jasmine perfume. Sweat. When each patient leaves, his or her smell remains in the room,building on the smells that came before. I drive home with the windows down, even if it’s raining. I try to air out the space that is around me. I am trying to learn to leave work and go back to smelling like myself. Green things: tea, grass, leaves, moss. I live in the Northwest where the rain always smells green and the green smells rainy. I like to smell tea, and coffee, even though I don’t drink coffee. Popcorn. Cookies in the oven. The crooks in the body of my love: nestling my head under his chin or against his back. Newly washed sheets. My mother’s shampoo. There are also some smells that I specifically associate with Judaism and that really bring me into whatever season they are linked to. Right after Yom Kippur there’s a holiday called sukkot, which involves (among other things) shaking a bundle of different long branches and a small yellow citrus fruit called an etrog. There is nothing like the smell of an etrog, summery and bright in a season where fall is coming on. Some Jewish smells are in harmony with the season (think apples and honey in the fall for the new year) but some, like the etrog, seem to suggest a time that is already ahead of or behind us, that we’ll catch up to ourselves in some other time soon enough. For me, those are the most reassuring smells. OH MY, Ayelet. That first section...?! Come on! An essay in and of itself. Heartbreaking. And so, so YOU. This makes me miss your writing more than I thought possible. Yes, what Britta said. I need more Ayelet in my life! My very favourite thing about this is this bit: "...of televisions with the sound off, of blood, of macaroni..." Such amazing juxtapositions. Blood and macaroni, that is going to stick with me forever. Wow. What a fantastic read. Kudos to both of you and thank you. Ayelet, I used to work in a psyche hospital and will always remember its curious smell of stale air, cafeteria food, antiseptic, urine, nervous sweat and industrial carpet. Good luck in your work. ayelet, you're wonderful. this is a lovely article and it's even nicer cause you're part of it. 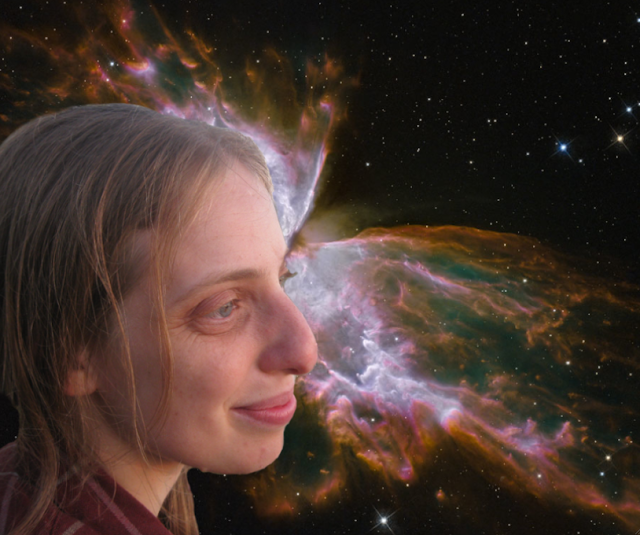 On the one hand, seeing you in the Butterfly Nebula made this click-through from Facebook worthwhile. On the other hand, I now miss you even more painfully. It makes me want to walk a few blocks down to the OSU hospital so that for a little while, my world will smell like you and I can pretend you'll be walking around the corner any minute. A very personal, yet James-Agee-inclusive, use of that nose of yours. Now with Baby Abby, a whole new volume of olfactories: the nose factory. Oh, how well you recollect and write! Your neighbor, Erik. Info yang menarik. Aku tunggu artikel yang baru. Terima kasih atas infonya. Aku tunggu artikel yang baru. Artikel yang bermanfaat. Kami tunggu artikel yang baru. Artikel yang sangat menarik gan. artikel yang bagus dan menarik. Informasi yang bermanfaat. Terimakasih atas informasinya. Aku tinggu artikel yang baru. artikel yang berbobot dan bermanfaat. informasi yang bagus. ku tunggu artikel yang baru.